ABC Russian: Russian? It’s child’s play! Although Russian isn’t as far removed from many European languages as you might think, it can’t help but appear impenetrable. Those funny letters, long words… Once you’ve mastered Russian’s complex grammar and got your head around those tricky consonant clusters, it often feels as if your language-learning journey is complete. That is, until you encounter one (rather large) group of Russian-speakers: children. Children have a language of their own. Children perceive our world differently from adults and, as a result, use many words in different ways (and sometimes far more or far less frequently than their parents). If you aren’t familiar with a child’s surroundings or routine – and, in a foreign language, their pronunciation – you may well struggle to understand them clearly. So, just in case you ever find yourself in a primary school in St Petersburg (well, you never know! ), here are a few child-friendly phrases to get you started. As in English, the Russian word for child has an irregular plural form: one child is a rebyonok (ребëнок), but two or more are most definitely deti (дети). Unless, that is, they’re rebyata (ребята) – a word used in informal spoken contexts. A PE teacher would round up children with the cry ‘rebyata, idite syuda!’ (‘ребята, идите сюда!’ or ‘kids, come here!’), rather than use the d-word. Rebyata can also be used to refer to a group of people in the same way that an English speaker might use ‘guys’. Rebyonok and deti are not one-size-fits-all nouns. In fact, the smaller the child, the longer the word: rebyonochek (ребеночек) means small child or baby. The suffix-k is often used to convey smallness or cuteness: for example, a young girl named Polina may be referred to as Polinka by her family. Similar modifications are also used on inanimate objects: a table is astol (стол), and a small table is a stolik (столик). Russian children often learn nouns in their diminutive form before they learn the full form; instead of calling a cow a korova (корова), they might recognize it as a korovka (коровка). Words and phrases for things associated with children tend to be formed from the root det- rather than reb- (although, as with everything, there are some exceptions). Detskii (детский) is used to indicate a connection to children: for example, detskii sad (детский сад), which literally means ‘children’s garden’ – or kindergarten. Parentless children may well end up in the detskii dom (детский дом), or ‘children’s home’ – often shortened to detdom (детдом). The Russian word for ‘school’ is easy to recognize: shkola (школа) – likeschool – comes from the Ancient Greek word skholē, meaning ‘leisure, philosophy, lecture place.’ Although some students might enjoy themselves, education is a serious business: the Russian word for ‘classroom’ (kabinet/кабинет) also means ‘office.’ As in most workplaces, Russian teachers are normally addressed by their first names rather than a title such as ‘Mr’ or ‘Miss.’ Russian speakers address each other in formal contexts by using their full first names and patronymics – for example, Elena Vasilievna Mironova(Елена Васильевна Миронова) would be called Elena Vasilievna by her students, but Elena (or Lena, or Alyona, or Elenochka…) by her friends. Less well-behaved students might ‘forget’ to address their teacher correctly, but remember to slip a shpargalka (шпаргалка), or ‘crib sheet’ in their pockets on their way into an exam. Don’t be too obvious when you cheat (pol’zovat’sya shpargalkami/пользоваться шпаргалками) though – it’s all too easy to end up with a nakazanie (наказание – punishment). How about playing catch? Or tag? Or tig? 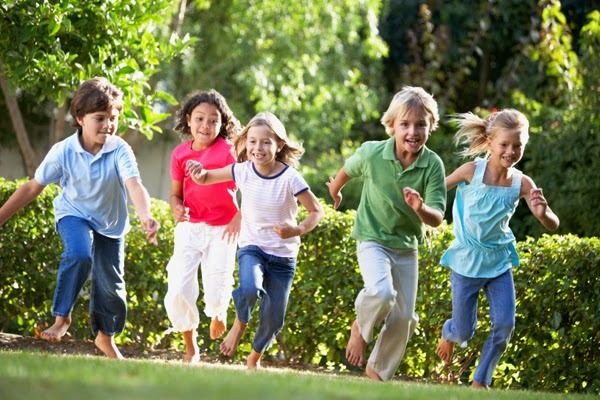 Russian speakers are also divided over the name – and the rules – of this classic children’s running game: variants include pyatnashki (пятнашки) dogonyalki ( догонялки, meaning ‘catch’), and salki (салки – about as nonsensical as tig). What about a nice old-fashioned game of ‘Cops and Robbers’? In Russian-speaking countries, the Cossacks are the good guys and children play kazaki-razboiniki (казаки-разбойники – ‘Cossacks-robbers’). After all that running around, it’s probably time for a snack. If you have trouble controlling your sweet tooth, then Russia probably isn’t the place for you. Although there are konfety (конфеты, meaning ‘sweets’) in abundance, indulge at your own risk. Russian-speaking mothers warn their little ones that too many saccharine treats will result in their bottom ‘sticking together’: u tebya popa slipnetsya (у тебя попа слипнется)! Word of caution: don’t say this to your grandmother (it is a tad rude!). And if the threat of a sticky bottom isn’t enough to scare you off the sweet stuff, I’m not sure what else to suggest. Sweets aside, Russian-speaking parents and elders are as keen as any others for their children to eat up: grandmothers from Voronezh to Vladivostokcan be heard telling their little ones ‘ne ostavlyai svoyu silu na tarelke!’ (Не оставляй свою силу на тарелке! ), meaning ‘don’t leave your strength on your plate!’. For the more linguistically economical parent, the imperative ‘doedai!’ (‘доедай!’) is to the point: ‘eat up’! So, if you ever find yourself in that St Petersburg school, at least you’ll know where to start. And if you find you’re getting confused, just doedai – you can’t talk with your mouth full!